The Osterreichische Flugzeugfabrik AG (Oeffag) was an Austrian company that built Albatros fighters under license from the home company in Germany. It was easier to build them there than to transport them from Germany and it allowed the Germans to keep home production for themselves. The Austrian front did not have the intense fighting that was common in France, and the needs of the Austrian Air Corps was not as great. Which was good because Austrian production speed was sluggish to say the least! 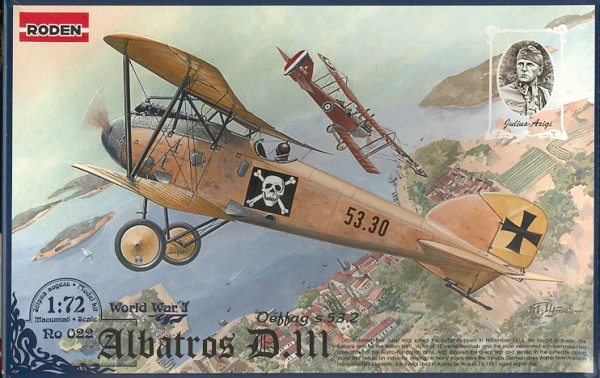 The initial versions of the Albatros D.III were exactly the same as what was being produced in Germany. The only difference was the replacement of the Mercedes 160 hp engine with a Daimler engine of 185 hp, giving a small performance improvement. Few of these were actually built as production soon gave way to a later version of the D.III. Upon opening the box, one finds all the parts in a thin cellophane bag. There are four sprues of white plastic and one quickly sees that there are extra parts. This is to allow several different variants of the aircraft to be built using the same basic sprues. Not a bad idea. What is nice is that you get all these parts and they are not removed during production as often is the case with other companies. The parts are well formed and have good detail. Not much in the way of engraved panel lines, but WWI aircraft were stitched together so used very little metal paneling! I received two different D.III kits, but only photographed one set of sprues, the worst of the batch. As you can see there is some flash on the wing sprue, but that is as bad as it got with the other kit having very little. There was flash on some of the other parts and some rough edges, but nothing serious at all. Sprue attachment points a admirably small. Some of the parts are quite delicate and I'd recommend a razor saw to remove them. No problems with sink marks or ejector pin marks. Some pin stubs were present, but inside large parts like the fuselage where they won't be seen. The instructions are superb. 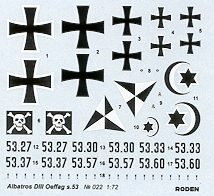 There are several logical construction steps with color information given as well as any specific info on parts that may be tied to a specific aircraft on the decal sheet. The back of the box offers a color chart using Humbrol colors and also gives a two view of the box art aircraft. This is a nice touch that would be appreciated from some other companies. Markings are given for six aircraft. Three are quite plain however, three are not and carried rather fanciful designs. A short blurb is given on the pilots who flew the aircraft in question. Obviously this info came from the tome 'Air Aces of the Austro-Hungarian Empire; 1914-1918'. In fact, I'd say that if you bought enough of all four Albatross D.III kits that Roden provides, you'd be able to build planes of most of those aces! This looks like a very nice kit. 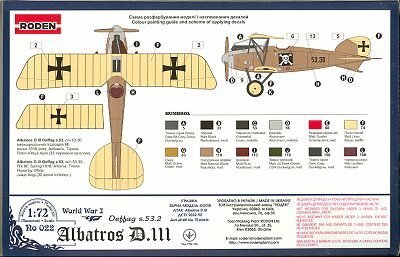 The small and fragile parts make this inappropriate for the new modeler, but those with some experience with the WWI type of aircraft should find this to be pleasant build. Those I know who have built this kit agree that it is a very nice one.